All over the world in the last few years there have been trials using Robots to care for the aged. This NZ Herald headline caught my eye “Older New Zealanders could soon be benefiting from new technology after a successful trial of healthcare robots to help them around the home”. The reality is actually much further away primarily due to cost! I decided to research a little further; after all when I am old it is highly possible these Robots will be popular even though they are currently very much experimental. It seems to me older folk have a very mixed reaction to the concept. This may of course depend on whether they live alone or in a ‘retirement village’. Living on your own when old might get a little lonely so I can see why a cat or a small dog would give you company. But a robot?? I do not see myself patting a robot!! Not even one covered in fur! Robots have been used for three months by five elderly citizens in a study by Auckland University about their feasibility in the home, particularly in rural parts of the country. Patients reported their ‘cyborg’ served as good companions, with some saying they enjoyed hearing the hardware talk to them and remind them to take their medicines. One person even said their robot felt like part of the family. Study senior author Elizabeth Broadbent said the results suggested that healthcare robots could be a viable option for use in rural homes. “Patients said that having the robot felt like they had a companion in the house and they didn’t feel so alone,” Dr Broadbent said. However in other trials around the globe the reactions have been less positive. Are New Zealanders different? 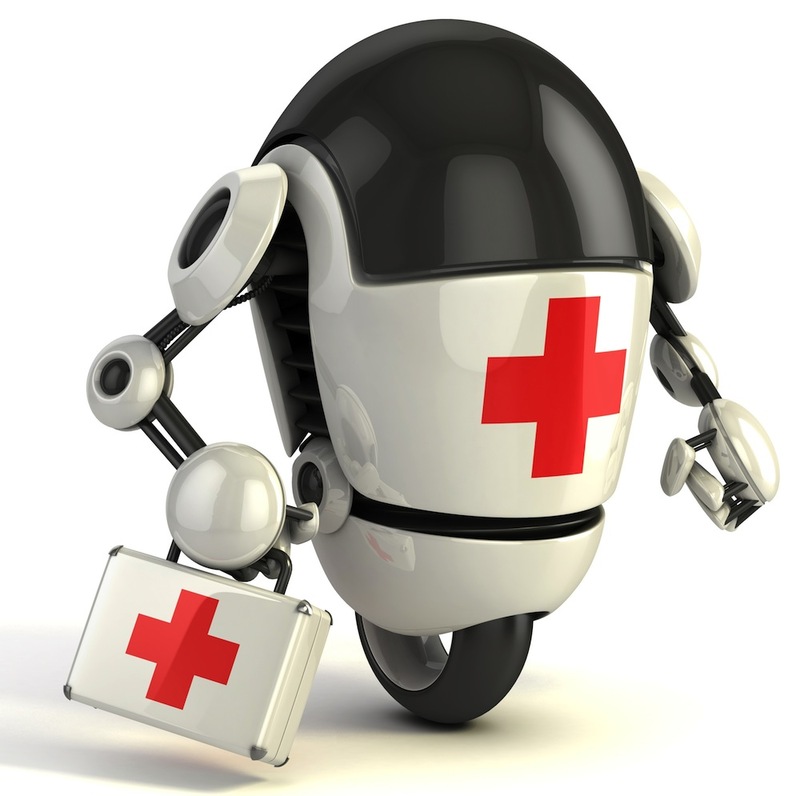 Gore Health Ltd, which runs Gore Hospital and a number of healthcare services, bought four healthcare robots in 2013, or healthbots, to help reduce costs, save staff time and improve patients’ long-term health. I wonder if they have ordered more? Japanese technology giant Soft Bank has unveiled a robot they claim is capable of understanding human emotions using an “emotional engine” and cloud-based . Standing roughly a metre tall with a tablet computer fixed to its chest, ‘Pepper’ will go on sale to the public next year for 198,000 yen (£1,150), with its creators hoping it will be using in a range of roles from caring from the elderly to baby-sitting. “People describe others as being robots because they have no emotions, no heart. For the first time in human history, we’re giving a robot a heart,” SoftBank CEO Masayoshi Son said at a news conference. Check out this video about The Giraff Plus Robot. Six elderly people across Europe currently have a new companion: a Giraff Plus robot, or Mr. Robin, as one 94-year-old taking part in the trial rather adorably calls it in the video below. It’s part of an EU funded project to use robotics to help elderly people who want to stay at home remain independent past the point they’d usually be unable to live alone due to physical or cognitive difficulties. Then there are devices that measure weight, blood pressure and blood sugar, and so on. “All of the data from the sensors is stored in the database and based on this we can extract some activities, like if the person is sleeping or the person got up during the night; the person is watching television or cooking,” said Loutfi. The robot—which is not autonomous—complements this by allowing virtual visits from friends, family, and healthcare professionals. “It’s basically the equivalent of Skype on wheels,” said Loutfi. 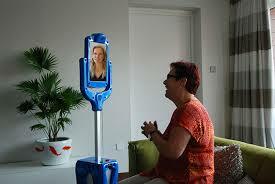 The user calls the robot and is able to direct it around the house to check in on the inhabitant. It’s intended to make visits easier for those who aren’t immediately at hand – if you saw someone was up in the middle of the night, for instance, you could use the robot to make a virtual visit. Separately, each device is nothing we haven’t seen before, but used together they create a 24/7 monitoring system that demonstrates quite how machines can outperform us in roles that are traditionally considered inherently human, like looking after loved ones. “The system comprises all these different aspects, but it’s putting them together that is really the novelty of the project,” said Loutfi. It’s also remarkable that the system is already in use in the real world, albeit among initial test subjects. Loutfi admitted that brought its own issues, especially given the different needs and habits of each user. “It’s not trivial to really make that jump to deploy the technology in the field,” she said. Challenges could be as simple as someone deciding to dust one of the sensors and accidentally moving it, or unplugging one because it was making a noise or shining a light. It’s intended as a complement to rather than a replacement for human-to-human visits, and Loutfi suggested it brought advantages like more continuous and objective measurements of how a person’s getting on. And the robotic part is no excuse not to keep in touch with your great aunty Doris. “It doesn’t necessarily take away the amount of social interaction; I would like to think it actually increases the amount of social interaction because it makes it easier for you to get on touch with the elderly person living at home,” she said. There are currently two of the systems in Italy, two in Spain, and two in Sweden, and while the research project ends this year, Loutfi said their plan was to make one of the companies involved responsible for marketing it for wider use. But despite that distrust, the EU reports that the European market for robots assisting older people is expected to reach €13 billion by 2016. I guess we’ll just have to wait and see whether that will end up predominantly in the form of multi-sensor monitoring systems, or animatronic baby seals! A special robot with 24 fingers has been developed for hair washing and head massage, useful if a person has limited arm movement. It is something Panasonic has also tried out in Japanese hair salons. Maybe this would be useful, it is hard to imagine. The kind of cheap, often well-educated labour, that has filled London homes with nannies and Barcelona’s with Latin American carers for the elderly, is not an option in many countries. Japan issues only about 50,000 work visas a year, a fraction of the 700,000 immigrants needed annually to prevent its population from shrinking, hence the focus on labour-saving tech such as robots for homes. 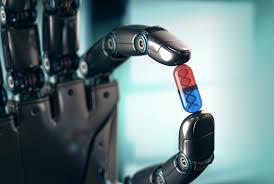 In New Zealand home care is very expensive, but are we ready to take the robot step?? Humanoid-style care robots were once the ideal. Japanese car makers who are behind some of the more advanced “domestic” robots even suggested a decade ago that there would be a robot in every Japanese home.It hasn’t happened that quickly. 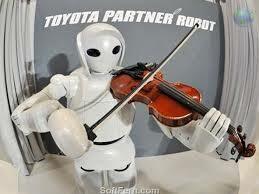 Toyota President Katsuaki Watanabe said he wanted robotics to be a core business for Toyota, which is now testing its robots at hospitals with what it calls “partner robots”. It had hoped to crack the market by this year. “We want to create robots that are useful for people in everyday life,” he said. There are home robots but they are simply not useful enough. “They should be able to do more. 200,000 elderly people fall and break a leg in the US each year. Robots could help here,” says Joseph Engelberger, the founding force behind industrial robotics and the father of the modern robotics industry. Recently the Japanese government announced the outlines of a less glamorous “Home-use Robot Practical Application Project”. “Robotic support of the infirm and elderly has got to be aimed at improving quality of life”. Quote from Geoff Pegman, MD. It has earmarked 7.6bn yen (US$93m; £58m) to get these more prosaic drones and lifters into Japanese homes, to commercialize simple home-use robots and to develop safety technologies and standards, which have been major issues. So far billions has been thrown at developing multitasking human like home robots that have very little practical applications now or in the near future. The idea now, it seems, is to direct money and energy into more modest, more practical robot-like devices that will help care for the elderly. Image caption Robot guides have been removed from hospitals because they “put patients off”.The Japanese government and care industry now seems to agree after robots have turned out to be too expensive, impracticable and sometimes unwelcome, even in “robot friendly” Japan. The country’s biggest robot maker Tmsuk created a life-like one-metre tall robot six years ago, but has struggled to find interested clients. Costing a cool $100,000 (£62,000) a piece, a rental programme was scrapped recently because of “failing to meet demands of consumers” and putting off patients at hospitals. “We want humans caring for us, not machines,” was one response. Sales of a revolutionary spoon feeding robot arm by Secom to help elderly or disabled people eat have fizzled out owing to its $4,800 (£3,000) price. Are we surprised!! For all its research, Japan has yet to come up with a commercially successful home robot says Yukihiro Goto, a senior medical tech analyst at Macquarie Japan.This robotic bed that converts into a wheelchair may be more realistic “Currently such tech is at an early stage, so there is little penetration. One reason is cost. The introduction cost is still very high and the tech not mature yet,” he says. With over 22% of Japan’s population already aged 65 or older, businesses are finding non-robot items such as remote-controlled beds and remote-monitoring gadgets are a better bet in a care technology market worth well over a billion dollars per year. With an eye on this growing market, large trading firms such as Marubeni are stepping in to promote devices such as a wearable health monitor designed by a team from Tokyo University. The HRS-I system monitors people’s health by capturing data – such as electro cardiograph signals and body surface temperature – and then wirelessly transmitting that data to a mobile phone or a PC where a health professional or family member can access it remotely. Japan’s mobile phone giants are also getting involved, while the country’s infamous hi-tech toilet makers are suggesting the existence of the millions of hi-tech lavatories in houses across Japan could also be adapted as health monitors. Demand is strong they speculate, not only because of a dearth of home helpers but also because the Japanese do not subscribe on the whole to care homes for the elderly, a hangover from the days when old folks often lived with their married sons or daughters. Now that Japan’s elderly face a much more lonely dotage some are exploring the idea that technology can be harnessed to keep an eye on the old and sickly using robot pets. One modest commercial success is Paro, the robotic pet seal – a clean, safe choice for emotional care when Fido ( a dog) or family is not an option. The Selwyn Foundation group brought 4 robots to New Zealand, at a cost of nearly $27,000.They looked like fur seal soft toys. When we engage physically with a pet robot, it stimulates our affection says Prof Takanori Shibata. More than 1,000 Paros have been sold in Japan, where they are used in nursing homes and hospitals, as well as by private individuals. The Danes too have been impressed. Following a trail in a dementia centre in Copenhagen using 12 Paro robots, the Danish Technological Institute announced that 1,000 of the electronic pets would be introduced in Danish nursing facilities by 2011. According to its inventor Takanori Shibata from AIST, one of Japan’s leading science institutes, Paro was even listed in the Guinness Book of Records as “the world’s most therapeutic robot”. But what makes the seal so practical is not its robotic skills but more its seemingly empathic responses. The robot seal provides Alzheimer’s patients with companionship Thanks to its artificial intelligence and suite of sensors, Paro can grow active or sleepy, show pleasure when held, and get angry when hit. He also understands simple words like greetings and compliments, and responds with calls and facial expressions. “We have been building pet robots as examples of artificial emotional creatures since 1995,” says Prof Shibata. Prof Shibata spent $9m (£5.6m) developing the stationary Paro, which retails for about US$2,800 (£1,735). 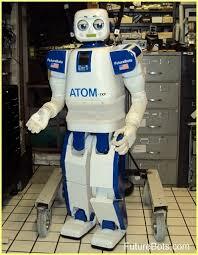 But with only a few thousand sold, like Aibo before it, the robot still remains far from a commercial success. Robots may have transformed the way cars are made, but for effective care technology, so far, they have only proved useful as a back-up to human care, no matter what Japan’s social services mandarins must be dreaming. A team of Queensland researchers has found a unique way to help people living with dementia stay in contact with their friends and family. Do listen to this video. More and more Australians are being diagnosed with dementia, and for many it can be a very lonely life, particularly if their relatives cannot visit them regularly. 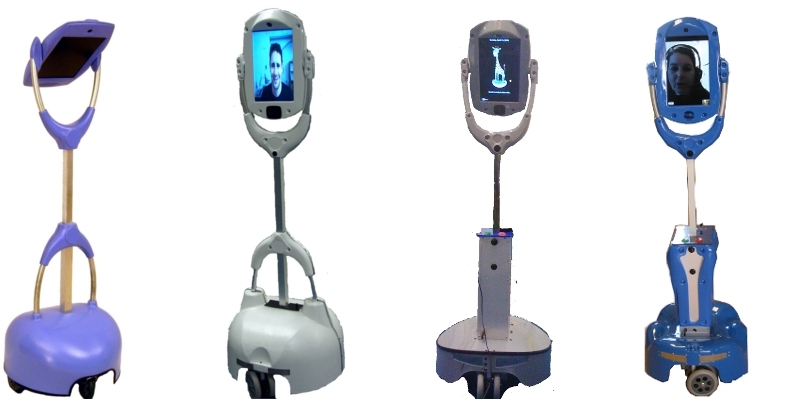 In response the researchers have created a mobile robot with an inbuilt camera, which can be used to set up video calls between people with dementia and their loved ones. Professor Wendy Moyle from the Dementia Collaborative Research Centre says the giraffe-shaped robot, named Gerry, is designed to facilitate video calls and has been described as “Skype on wheels”. “The giraffe is quite tall. It’s quite a large robot and its head is greater or the same size as a human head,” she said. Professor Moyle says it would be kept inside the home of a person with dementia, but controlled remotely by their relatives. “For example, they might live in the Gold Coast [and] their family member could be in Perth. They would call in to the robot, wake the robot up, the person with dementia doesn’t need to do anything at all,” he said. “The family member then could drive – through their own computer – drive the giraffe actually to the person’s bedside or if they’re outside in the garden to connect directly with them.” At a cost of about A$9,000 per robot, researchers admit it will be a long time before the technology is widely accessible to the 298,000 Australians believed to be living with dementia. So The Herald quote “Older New Zealanders could soon be benefiting from new technology after a successful trial of healthcare robots to help them around the home”. Seems far from reality from most of the research I read although the”Giraff” might become commonplace. Who knows? 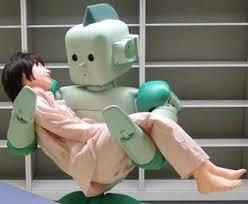 How do you feel about having a robot care for you in ten or 15 years time?? The jury is out?? Love some feedback please about how you feel about the changes ahead for aged care. This entry was posted in Thoughts and tagged Giraffe robot, Gore Healthcare, health care for the aged, Humanoid, Japan aged care, Macquarie Japan, Paro, Paro robots, R.U.Robots, Robot manufacturers, Robotic support of the infirm, robots, robots for dimensia care, robots in healthcare, Selwyn Village, Toyota President Katsuaki Watanabe by kiwigrannz. Bookmark the permalink. I think I can see a possibility of Robot care in dementia Units, because with severe memory loss the connection with known family or friends is lost or barely present and a robot which can be in constant attendance may be easier for the person to remember or connect with. i personally can’t imagine a furry pet robot ever giving (dementia or not!) anything like the emotional satisfaction of a living cat or dog who shows such love and affection by a wagging tail or a purr and gentle rub against one’s leg!